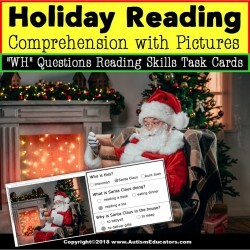 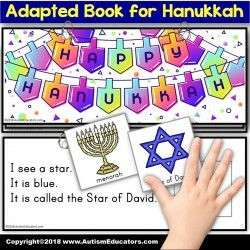 Adapted Book HANUKKAH Learn about Hanukkah and Jewish holiday traditions with this Adapted Book for ..
Christmas Picture Comprehension Task Cards “Task Box Filler” Christmas and Hanukkah Picture Comprehe.. 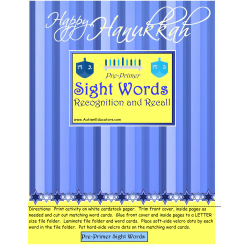 This Hanukkah Pre-Primer Sight Word activity contains 2 brightly designed file folder work tasks. 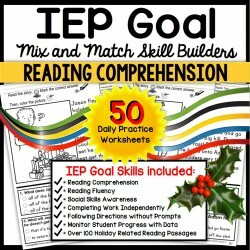 Su..
READING COMPREHENSION IEP Skill Builder December Social Skills WORKSHEETS (focusing on feelings awar..